Thank you for your interest in rescuing! Below is a general list of where we hold adoption events, however, it varies week to week depending on special events and the number of animals we currently have available. Another great way to find out where we’ll be for our weekend events is to check our Facebook page at https://www.facebook.com/OFOSA/. And, we always have a few adoptable pups at Fido’s World’s First Dog Tap House in Tigard. Check out those details here: http://ofosa.org/unique-adoption-partnership-ofosa-fidos-worlds-first-tap-dog-house/. Before attending an adoption event, please read our Adoption Process Page Here: http://ofosa.org/adoption-process/. Thank you for your interest in saving a life! Head over to PetSmart-Cedar Hills and/or PetSmart-Hillsboro and meet our sweet kitties looking for their forever homes! Check our website for more info! www.ofosa.org. Join us at PetSmart - Tanasbourne on Saturday for our adoption event! We'll be there Noon to 4 pm! Lots of sweet pups looking for their forever homes! 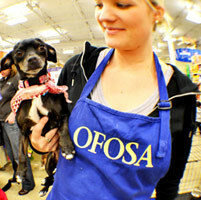 Please read more about each pup as well as our adoption policies on our website: www.ofosa.org. Abby Lane, look at Faith! Whatcha doing tomorrow? Copyright © 2000–2019 OFOSA All Rights Reserved.